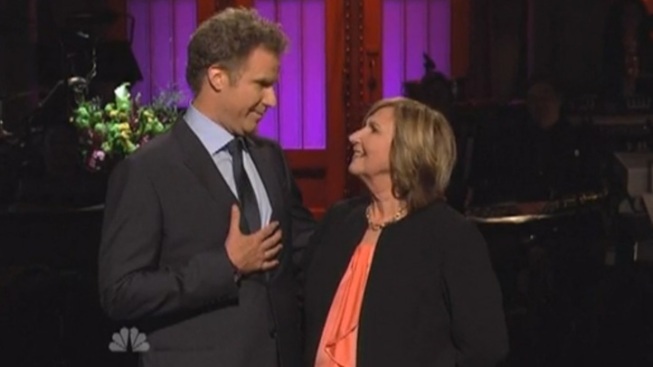 Will Ferrell delivers a Mother's Day message during his opening monologue to his mother. Comedian and former "SNL" cast member Will Ferrell went back to his roots and hosted "SNL" for the third time, bringing along some former characters and cast members for the star-studded ride. This week’s episode also celebrated The Lonely Island’s 100th digital short. The R-rated celebration featured a new song with Andy Samberg, Jorma Taccone and Justin Bieber. The pre-filmed sketch was peppered with throwbacks to Digital Short favorites, including Justin Timberlake bearing presents in a box, a “crazy” Natalie Portman, and Jon Hamm reprising his role as Sergio the shirtless saxophonist. Joining the roster of A-list appearances was another important guest: Ferrell’s mother. In his opening monologue, Ferrell commemorated Mother’s Day by delivering a self-proclaimed “best Mother’s Day message ever.” Forgoing the cue cards and speaking straight from his “brain place” to his “mouth hole,” Ferrell poetically declared his love for his mother.